Our eyes are instruments of light that register darkness as absence of light. We never see darkness. We don't know for certain what it is. Shadows moving under the moon and shade growing from the ground in sunlight give the illusion that darkness moves. Even night appears to slide around the planet, but darkness never moves, only is moved, controlled by the position of light. Our bodies, filled with darkness, move darkness, give darkness a self. These poems tracking that movement, metaphorically and literally, search for the opposite of self, as light is the opposite of darkness. Ron Houchin, a retired public school teacher in the Appalachian region of southernmost Ohio, taught for thirty years. Though raised on the remote banks of the Ohio River in Huntington, West Virginia, he has travelled throughout Europe, Canada, and the U.S. His work has appeared in Poetry Ireland Review, The Stinging Fly, The Southwest Review, Appalachian Heritage, The New Orleans Review, and over two hundred other venues. He has been awarded an Ohio Arts Council Grant for teachers of the arts, a tutorial fellowship to teach in a Dublin writing workshop, a poetry prize from Indiana University, as well as a book of the year award from the Appalachian Writers' Association. His poems have been featured on Verse Daily. He has published three collections with Salmon. tired lace about its neck. all day on the sand. from the tips of trees. "Even as I begin to write this review, I see the periods in the heading as seeds, an image given me by Ron Houchin in his poem 'Arcturean Tree Poets.' The whole collection is like that -- image after memorable image, metaphor after startling metaphor. This is a book I promise myself to read over and over and over." "His poetry is distinctive, enjoyable, audacious." that stare and try to speak. amid angered sun and darkness. carried enough colour to notice. nor in any eyes of King David's wives. These poems also harbor a seriousness and austerity that makes them hard to ignore. One can imagine Wallace Stevens reading these poems in his slow, precise, meditative tone. Houchin's poems, in fact, recall the work of Stevens more than that by contemporary writers. He uses them to meditate and imagine. They reveal the world outside the window and then they reveal the window, too. They contemplate meaning as readily as appearance, then say goodbye to both with long, resigned sighs. 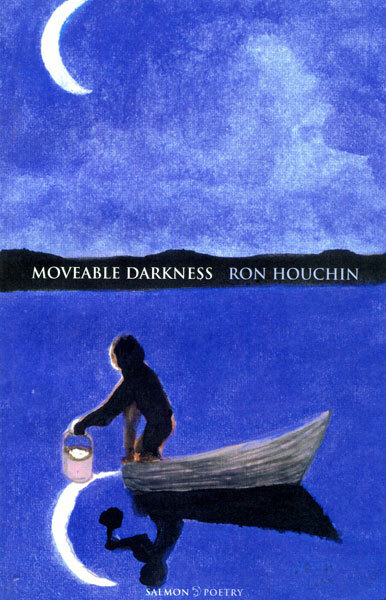 Moveable Darkness also is a visually magnificent book. A lake-and-moon portrait by Ariyan cloaks the cover in rich purple, pastel blue, black and white, with a nebulous figure on a boat pulling moonlight in a bucket from the water. The physical book is like Houchin's poems in that way: a vivid portrait without and a different world full of ideas within. Recommendation: This is a book worth having on shelves, coffee tables, night stands. Moveable Darkness sings with the severity of oarsmen lashed to their oars, wailing for their journey that never seems to end. Take the ride. See where it leads you. The places you go more than make up for the fare. "Even as I begin to write this review, I see the periods in the heading as seeds, an image given me by Ron Houchin in his poem 'Arcturean Tree Poets.' The whole collection is like that -- image after memorable image, metaphor after startling metaphor. This is a book I promise myself to readover and over and over." Barbara Smith, Grab-a-Nickel, vol.xxiv no.1 from Alderson-Broaddus College in Phillippi, West Virginia "His poetry is distinctive, enjoyable, audacious."